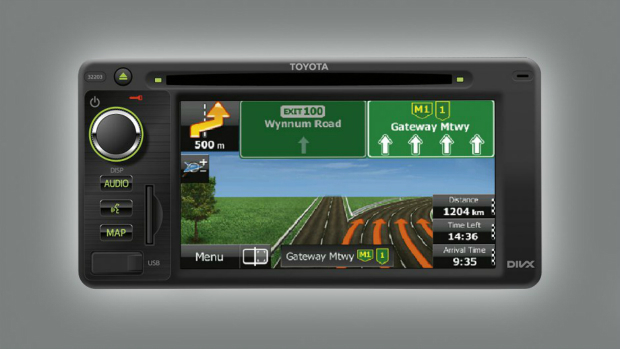 Below are a selection of Toyota factory accessories for the LandCruiser 70. Make a No Obligation Enquiry for more information on availability and compatibility with your vehicle. 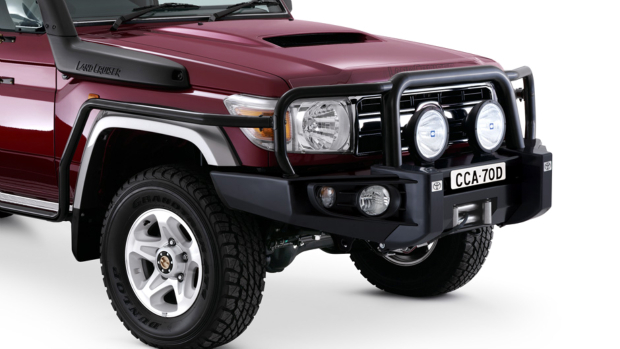 Designed and engineered to provide increased protection for your LandCruiser 70 Series, this high grade polished Alloy Bull Bar is purpose built to carry the Toyota Genuine Superwinch (sold separately). Features include recessed fairlead mounting, large cable viewing area and a fairlead cover plate if a winch is not fitted. 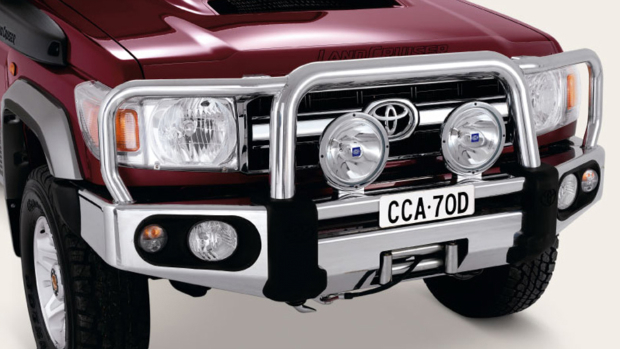 Mounting points for Toyota Genuine Driving Lights and two CB antennae are also included. The Alloy Bull Bar is fully tested for airbag compatibility, both with and without Toyota Genuine Accessories. Engineered specifically for the LandCruiser 70 Series, this rugged steel, Superwinch compatible Bull Bar provides added protection for your 4x4. 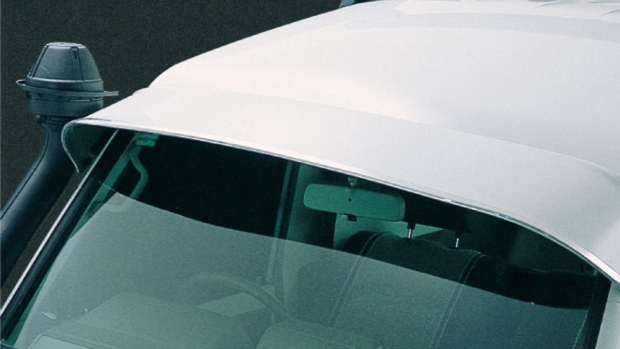 The Bull Bar's precise design allows for optimal airbag deployment and occupant safety. Powder-coated black to reduce corrosion, it includes two mounts for CB antennae and can also be equipped with matching Toyota Genuine Driving Lights and Side Rails. All sold separately. The Toyota Genuine Alloy Wheel Lock Nut Set means your alloys can be securely locked, protecting them from would-be thieves. 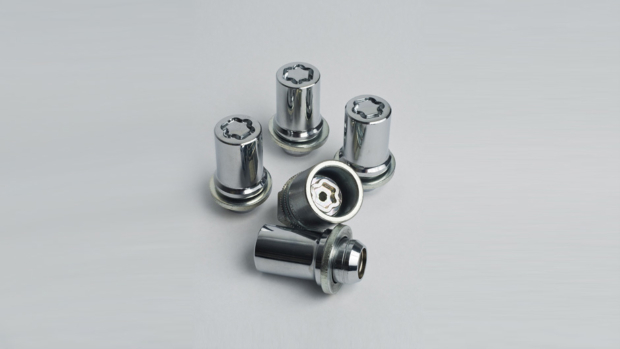 The strong, premium-quality chrome-plated Wheel Nuts come with a unique securecoded key to lock the alloys in place without detracting from their style and appearance. 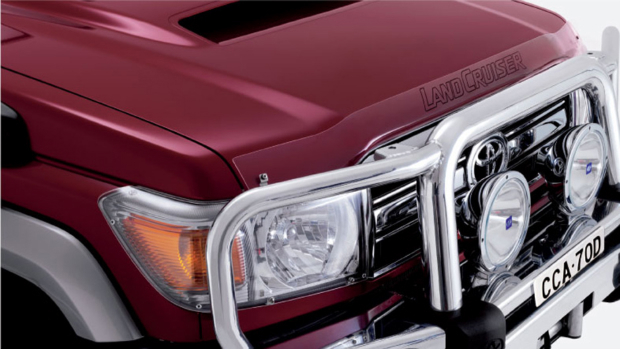 Add style to your LandCruiser 70 Series while helping to protect your bonnet from stone chips and scratches. Contoured to suit the new LandCruiser 70 Series, the high strength Bonnet Protector is constructed from UV resistant acrylic. Toyota Genuine Headlamp Covers are designed to help protect both your headlamps and your front indicators. The extra large design fits across all of the main lamps to reduce the chance of stone chips and cracks. 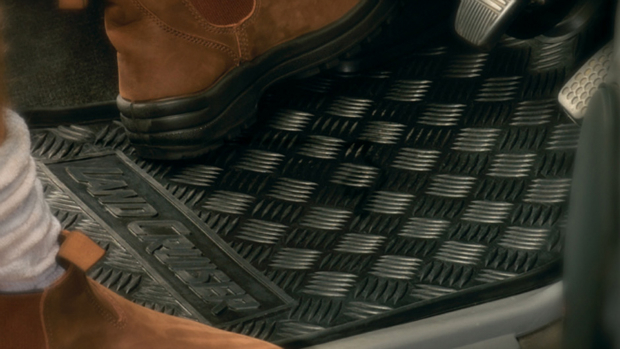 Both of these durable, UV resistant covers are also easy to remove and refit for cleaning. When driving on country roads at night, Toyota Genuine Driving Lights increase your range of vision, giving you more of a chance to detect potential safety hazards. 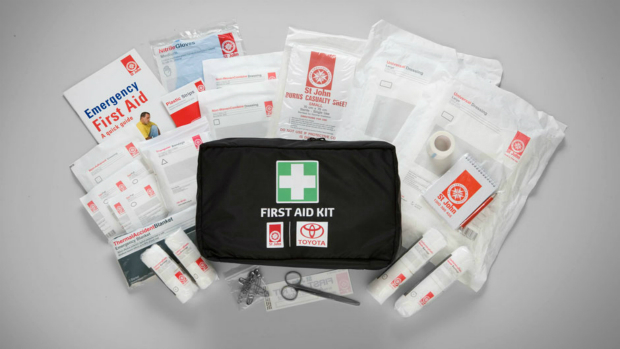 For anyone driving long distances, they are an essential safety aid. 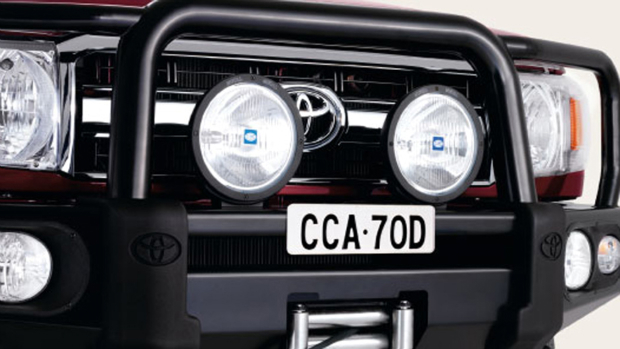 Available in chrome or black, the Toyota Genuine range of Driving Lights are suitable for fitment to all Toyota Genuine Bull Bars. Perfect for carrying those long and awkward loads, these durable commercial strength Toyota Genuine Roof Racks with extra large crossbars are available as a 2 bar set with 3rd bar optional. 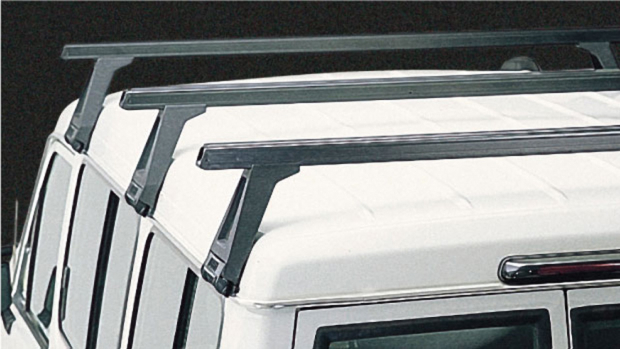 Toyota Genuine Heavy Duty Roof Racks feature black anodised extruded aluminium, a rubber bump strip on top to protect your cargo, and plastic end caps for safety. Compatible with many commonly available roof rack accessories. The newly introduced Toyota LandCruiser 79 Series model is available with shorter versions of Toyota Genuine Tray Bodies to meet the unique requirements of the double cab chassis. The new shorter tray bodies are available in alloy and steel (with timber, flat steel or checker plate floor). All Toyota Genuine Aluminium Tray Bodies come with new 'Quick Lock' hinges, which are manufactured from automotive grade glass-reinforced nylon and incorporate a captive stainless steel pivot pin. Toyota Genuine Tray bodies are not just built to last. All are built to the safest standard and steel Tray bodies can even be colour matched to the vehicle for a streamlined, uniform appearance. 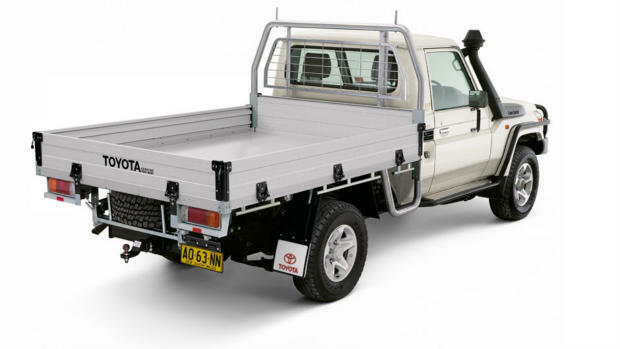 Toyota Genuine Aluminium Tray Bodies are available in General Purpose and Heavy Duty variants and an extensive range of Toyota Genuine Tray Body accessories are also available. Designed to help protect your vehicle's side step and front fenders in rugged terrain and heavy-duty situations, Toyota Genuine Side Rails are constructed from high grade steel and are black powder coated for corrosion resistance. Choose from front fender protection only or front fender and vehicle side protection (pictured). Requires Toyota Genuine Steel Bull Bar. The Toyota Genuine Superwinch is the ultimate accessory for the workhorse or adventure-bound LandCruiser. Delivering a pulling capacity of up to 9000lb/4082kg, it is powerful enough to pull the vehicle through tough terrain, and is vital for anyone going off the beaten track. The Superwinch's galvanised wire rope comes equipped with a nylon sheath around its leading end to protect the vehicle's Bull Bar while its durable, rubberised hand remote control with water resistant toggle switch is designed for safe and dependable operation. 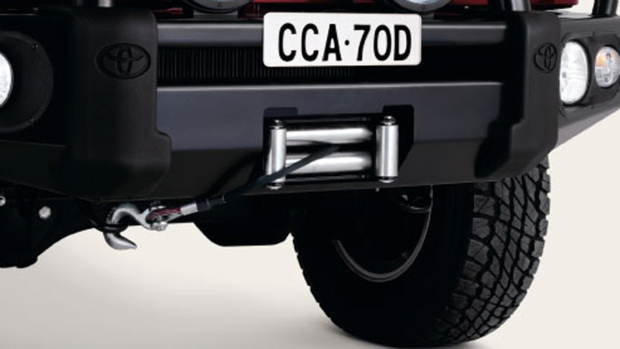 Tow with confidence using this practical, tough towbar with a capacity[J8] of 3500kg (braked) and 750kg (unbraked). 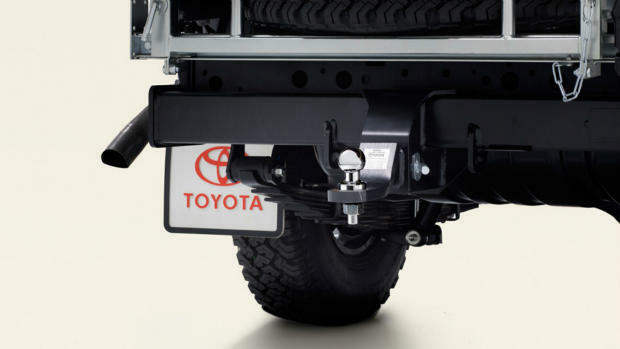 Tested and approved by Toyota engineers, and black powder coated for corrosion resistance, the Toyota Genuine Towbar meets stringent Toyota safety and design standards.Image shown does not include Wiring Harness. [J8] Towbar capacity subject to regulatory requirements, towbar design, vehicle design and towing equipment limitations. [G7] Suna(TM) GPS Traffic Updates are only available in the following metropolitan areas: Adelaide, Brisbane, Canberra, Gold Coast, Melbourne, Perth and Sydney; it operates from information provided by Intelematics Australia and may not cover all road incidents and congestion. Please see www.sunatraffic.com.au for details. 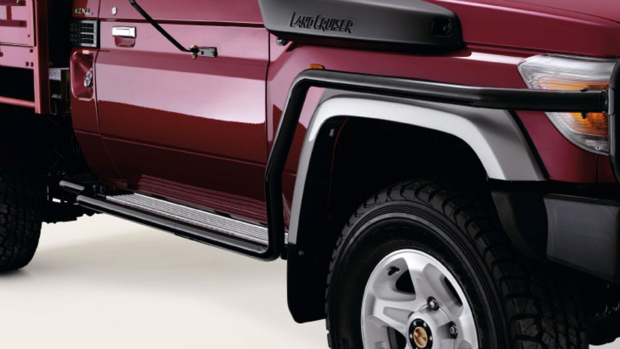 Designed specifically for the LandCruiser 70 Series Troop Carrier and Wagon, these Cargo Barriers are securely fastened to help protect vehicle occupants from moving cargo in the event of a sudden stop or accident. 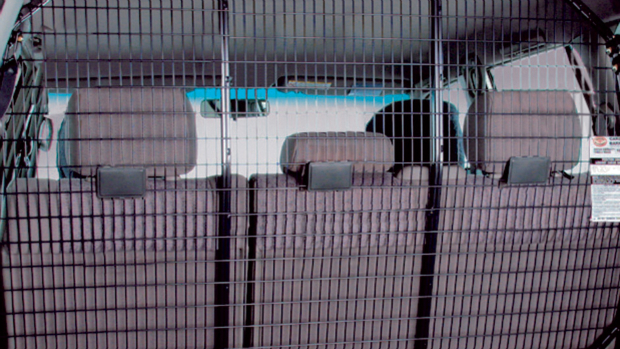 Powder coated dark grey for corrosion resistance; the sturdy welded steel mesh construction is designed and tested to meet stringent Australian safety standards. 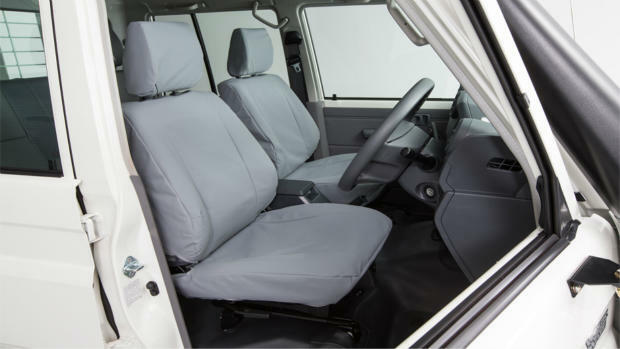 High quality and hard wearing Toyota Genuine Accessory canvas seat covers are available for the new Toyota LandCruiser 79 Series. The covers use a heavy duty, waterproof canvas material that protects the vehicle seat from day-to-day spills and general wear and tear. The material is washable, and minor stains can be easily cleaned with a wipe. 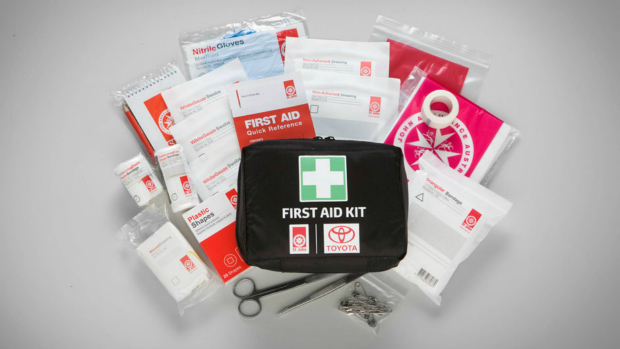 As with all Toyota Genuine Accessories, the covers are designed to fully comply with the vehicle's other functions, which means they do not impact its ADR compliance and will not impede the function of seat adjustment mechanisms, seat belts, head rest restraint and the child restraint anchorage. Toyota has launched a range of LandCruiser 70 Series Genuine Accessory Load Distribution hitches which improve vehicle control and stability when towing. 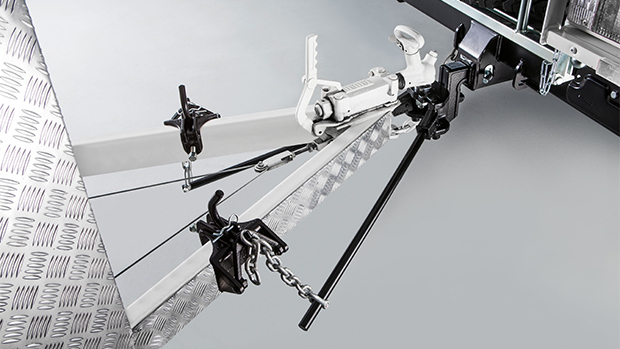 The Toyota Load Distribution Hitch (LDH) assists in correctly distributing the load over the towing vehicle and trailer. Toyota LDHs are designed and tested to meet the Australian Design Rule strength standard and stringent Toyota system durability standards. A Toyota Genuine Load Distribution Hitch ensures there is no damage to your vehicle or Toyota Genuine Tow Bar and leads to improved handling and an overall safer towing experience.